It's so nice to have some pictures from outside, being in Leeds pretty much 100% of the time it kinda limits me where i can take pictures. We're surrounded by buildings and i don't have a car in Leeds, so it's just so much easier doing them inside against a blank wall. But as we're back at my home, which is smack bang in the middle of the country side, i thought I'd make the most of it and take some photos from a walk we all went on yesterday morning. It was very cold(showing -7) but it was so pretty. I've added some photos to my Flickr if anyone wants to see. I've totally loved being at home, eating a stupid amount of food, drinking Malibu constantly and playing too many games. Our favourite games have been Cludeo, Yahtzee & Uno. We're doing a running score to see who gets the most points after the 4 days. Which is today, which also means tomorrow me and Matt go back to Leeds. But it's only for a couple of days because we're going to visit his mum up in Newcastle for new years/Christmas take 2. Tell you what, I'm going to be on such a come down next week! So i hope you had a lovely Christmas, my main present was a Canon 1000D (which was Matts before he got his new one) But it's only a couple of months old, so it's pretty much brand new. I've had my outfit photos taken with it for so long now, that at least i have a slight understanding of its workings. I'm planning on doing another post full of Christmas pressies later on this week. I didn't get a silly amount of stuff, just practical things really. I'm all about just having a laugh and enjoying being lazy with my favourites. I'm absolutely dying to go shopping, i really don't have any money though. It's still another month until i get my student loan and I've been waiting all month for my college bursary. I hope there's not been a problem with it, because i really need it to pay bills! I did manage to treat myself to something in the ASOS sale. I did spy two dresses in River Island as well, but because i faffed about too long about getting them, they've now sold out online. I'm hoping there's still some available in store, but I'm not counting on it. Never mind, I'm sure I'll find some other little bargins. Ok, so that's my little update, I'm now going back to the chocolate! (blatantly put back EVERYTHING i lost lolz) Enjoy the rest of your lazy days! love the pictures! know how you feel, I'm craving going shopping but am going to Paris soon, so probably should wait! we have that competition with games too..Have a great break off! You look great, and yay for the new camera - that's such a great present! I love board games too, they're so funny to play with your whole family! This years sales were a bit of a fail for me, what with tube strikes, sites crashing etc. If I do manage to get to one, I'm guessing most of the good stuff will be gone by now! Lovely photos, the snood/scarf looks lovely & cosy! Love out door photos, they always look happier & just nicer. I got a new camera too *does a little dance* hehe, looking forward to seeing your other pressies though. Haha I'm feeling so fat after my Christmas binging!! once again, hellooo hair. it look lush. you look very pretty here. 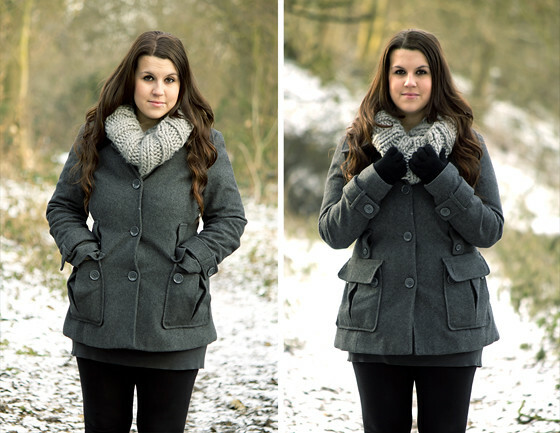 Love these outdoor pics, great winter look, love the snood! You look absolutely gorgeous hun, very cosy. I really love your style and the way you put together outfits. Effortlessly beautiful too without shed loads of make up on like you see some people wearing! You outfit here is so sweet and winter-y! I sometimes wish it snowed in Australia for Christmas, but seeing what it has done to everyone in the UK this year, I am rather glad its blazing hot here! I love the dress you got from ASOS as well, such amazing colours and such a good price! I find it hard to find like age appropriate dresses on ASOS, but you have spotted a gem here! Cute coat, I really adore all the wintery tones to these photos. You look absolutely gorgeous, the colours really suit your hair colour and skin tone. Speaking of your hair.. i want it, its lovely! Your hair looks great! I ordered a red coat yesterday in the sale from New Look, not seen anything else nice though really. I am too impatient with sales though! Whoo! Love this outdoor outfit post. It's unfortunate how sometimes our environment forces us to take indoor photographs all the time. Also, totally with you on the bursary front. Got bills, bills, bills, and am also anxiously awaiting loan money.